This multi-sensory reading, spelling and penmanship CD-ROM program builds an association between symbols and sounds in the English language through self-paced repetition. It utilizes the close association of visual, auditory and kinesthetic elements to help students improve their language skills. The beginning of the program assumes the student does not know the letters of the alphabet. The program then proceeds to teach all the skills one needs to read on a sixth grade level. Extensive practice in reading, spelling and penmanship throughout the program. Specific language skills taught include suffixes, prefixes, the six syllable types, consonant digraphs and blends, diphthongs, singular and plural nouns, apostrophe and contractions, punctuation, exceptional words (words to be memorized), sentence and paragraph structure, etc. 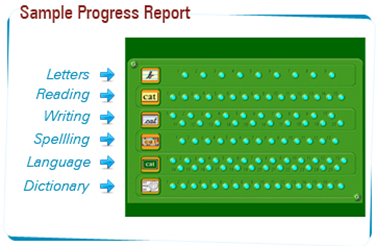 Students and teachers can move to different lessons/modules in the program by utilizing the progress report. They can click on the "DOWN ARROW" after the short introduction. This will take them to a progress report. The names of the modules, in the program, are located on the left side of the screen (letter, reading, spelling, writing, language and dictionary lessons). When you "click" them, the voice will identify the name of the module. Next to each module are numbered buttons. These numbers correspond to the numbered lessons in the table of contents, in the manual, inside the binder. One may click on the numbered button and right to the lesson of their choice. Teachers can decide if they wish to have a student follow the sequence, as it is presented on the CD-ROM, or may decide to use the CD-ROM to reinforce a particular reading skill which was just introduced in class.